Easter? But that was so last weekend right? Not for the Greeks (and Serbians, Russians, Bulgarians and every other Orthodox religion out there). We’re special so our Easter is a moveable feast. 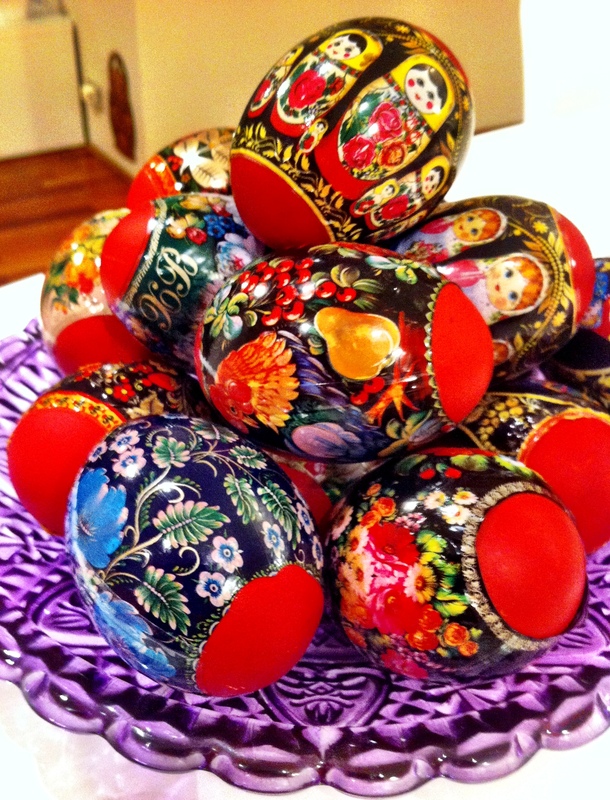 The date follows a modified Julian calendar which means it can sit up to a month before or after conventional Easter. Quite confusing when you’re small and marking the occasion before the hot cross buns have gone on sale in Woollies. The lead up to Greek Easter (Lent) is a time of fasting. That means no meat, poultry, milk, cheese, eggs and fish with backbones. It’s a method for cleansing your body and soul (a precursor to the modern detox if you like). To be honest, I was always more about the feast than the fast. 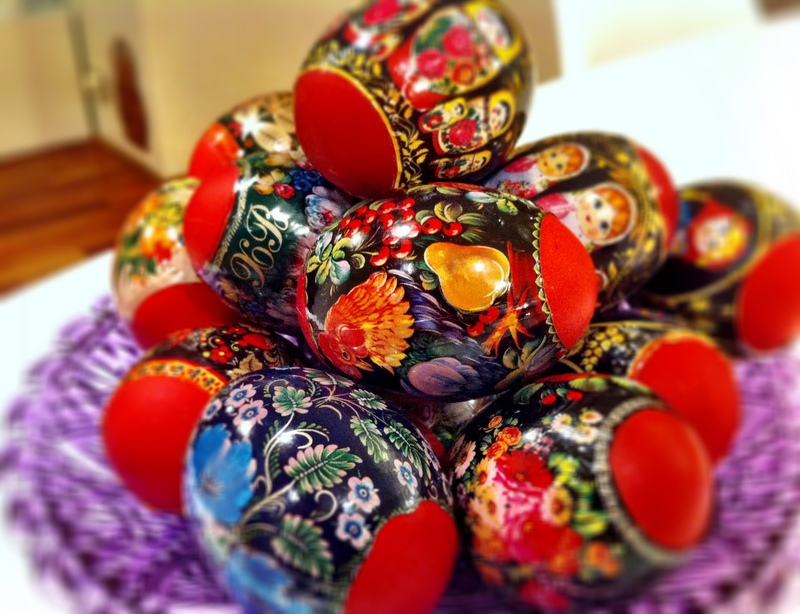 Forty days of fasting culminates in a 2am feast to celebrate the resurrection of Jesus – think magiritsa (offal-based soup that’s tastier than it sounds), tsoureki (brioche-esque sweet bread), avgolemono (egg-lemon chicken soup with rice) and of course, red eggs. To be fair, fasting food is not to be sneered at. 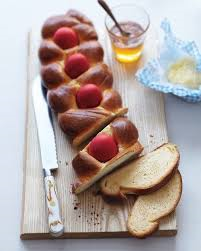 I completed the Easter-themed Kytherian Kitchen classes a few years ago and learnt how to make some exceptionally tasty traditional fasting dishes. Gigandes are a perennial favourite of mine, if only for the fun you can have with the pronunciation. This dish of dried lima beans slow cooked with vegetables is a hit during times of fasting and basically a complete meal. 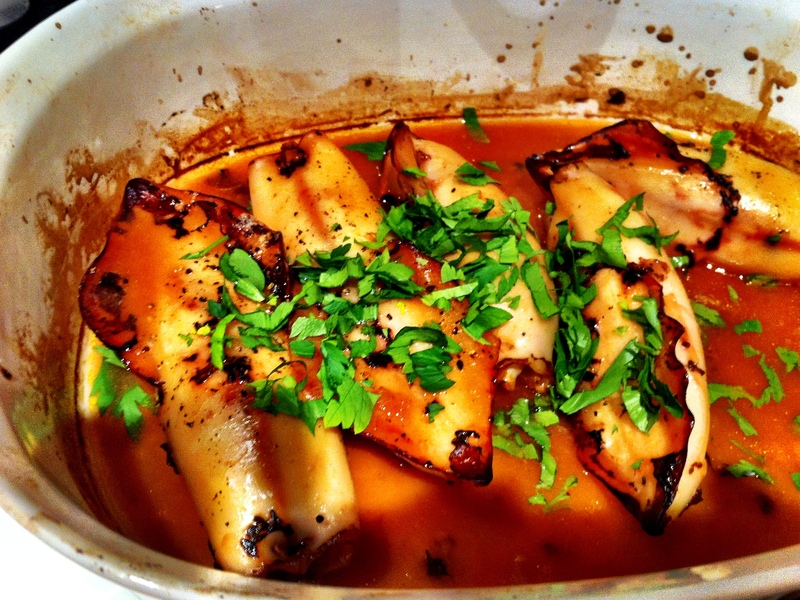 Calamaria yemista literally means stuffed squid. The stuffing is a mix of rice, finely chopped vegetables, white wine and herbs which is spooned into squid hoods and baked. 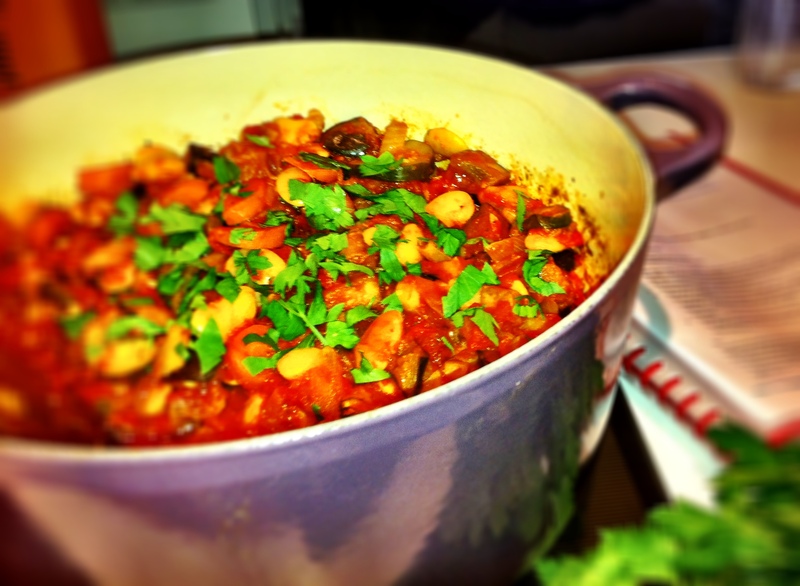 Makes for a delicious mezze at any time of the year. Moustalevria is grape must pudding. Must is freshly pressed grape juice which is unfiltered and unfermented and in this dish it creates something resembling a cloudy jelly. 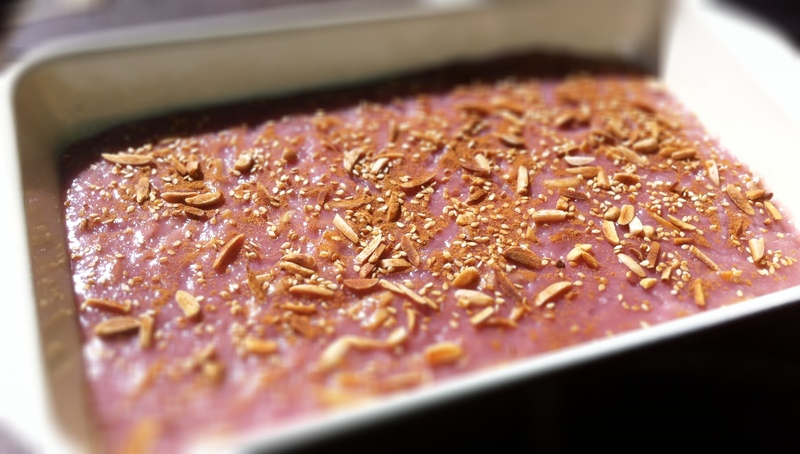 Topped with toasted nuts it’s a tasty snack and some would even claim, a bona fide fasting dessert. But back to the feasting. 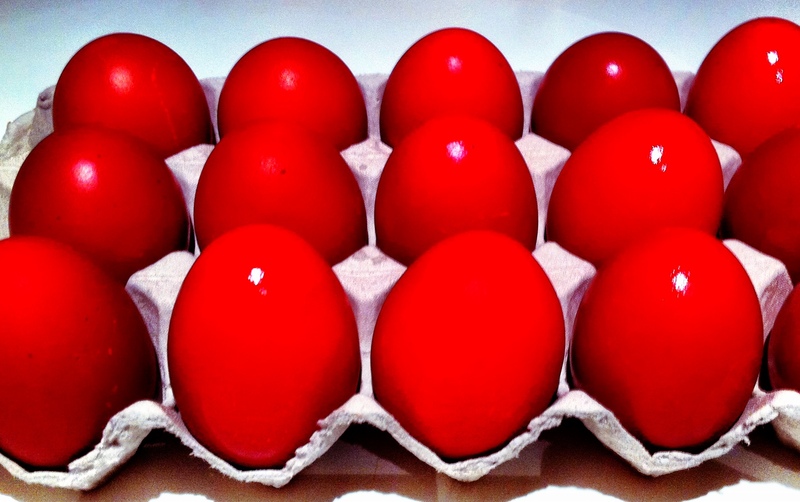 Don’t laugh, but to me, red eggs are undoubtedly the highlight of Greek Easter. We don’t just dye them and eat them – we crack those babies enthusiastically one-to-one, end-to-end, until only one person has an unblemished side remaining. That person is the winner! I’ve never quite got my head around what they actually win but it is certainly a source of pride for the lucky soul. One year while yiayia and I were dying eggs red, I tried a new spin on the classic red by adding these stunning patterns (no I didn’t hand paint them, they are transfers). Yiayia wasn’t impressed. It’s more of a Russian tradition than a Greek one and she’s not one to improvise at the age of 86. This year Greek Easter takes place in a few days, so yiayia is busy dying eggs (plain) red while mum will be scoping out which Greek cake shop has the best tsoureki.